Mood board: In his first menswear collection for the brand, Peter Dundas re-set the Roberto Cavalli clock back to 1970s-infused chic. 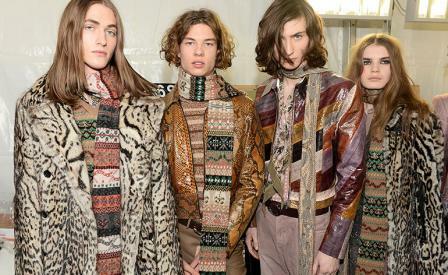 He called it ‘real opulence’ and with the amount of animal skins, rich velvet and ornate embroideries it certainly was; but the cool thing here was the way Dundas made his rocker-inflected clothes look ready to slide on and wear every day. Scene setting: Underscoring the glamorous, decadent new mood was the 17th century Palazzo Crespi, the most tightly locked private villa in Milan, which Dundas lassoed effortlessly for his show. The rich, warm interiors - which were restructured in the 1920s by Milanese architectural maestro Piero Portaluppi - are lined with priceless works of art including a fleet of giant canvases by Venetian artist Canaletto. Guests took in the show under frescoed ceilings and on neoclassical furniture, wrapped in damask walls and decorative carpets. Best in show: Dundas’ clothes all had a whiff of aristo kids on vacation. Apart from the long lean suiting with converse low tops and ropes of scarves trailing behind them, the best of these were the denim pieces crusted in colourful spools of embroidery and velvet jackets crusted with metal and crystal beading.